I’ve logged some hours this season fishing dry-droppers on my Euronymphing setup. It is a great way to both tightline and throw dries with one rig. Along the way, I’ve cataloged a few observations that I thought would make for decent blog content and might be helpful, especially to those starting out or experimenting with their tightline or Euronymphing game. It’s always a bonus when fish eat your strike indicator. There are many ways to fish a dry-dropper, but here I’m talking about using a dedicated rod with either a Euronymphing line or mono running line. I’m using essentially the same setup I would use to fish two or three weighted nymphs, but here, I replace the top nymph with a dry fly capable of suspending one or two small and weighted nymphs. Rather than converting my rig to a dedicated dry-dropper leader, I made quick conversions by snipping off the top nymph and replacing it with a dry fly when conditions warranted a change. Windy conditions: When breezy conditions make tightline nymphing challenging or impossible, a suspender rig allows me to get a better drift. Rising fish: For obvious reasons, the chance at a surface take is always fun. A quick adjustment allows me to target fish feeding on or near the surface. A shallow pupa or emerger nymph can be deadly during hatches. 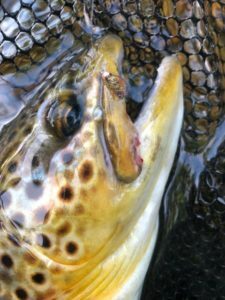 Long-range presentations: I’m able to throw the Euro dry-dropper a considerable distance which makes long, upstream presentations possible in shallow water. A dry fly is less obtrusive than other suspenders and less prone to spooking fish. I fished a lot of water that I otherwise would have waded through in order to get to the faster water more suited to tight-line nymphing. Mood: Tightline nymphing requires a considerable amount of focus and attention. I find the dry-dropper to be a relaxing alternative when I either can’t or don’t feel like concentrating. This method limits the depth of water I’m able to cover, however. 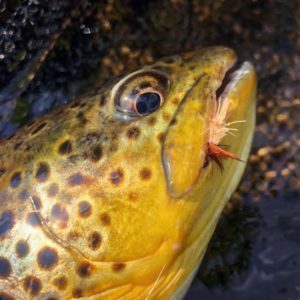 Keep in mind that I’m using this technique when water temperatures have fish feeding actively and fish are willing to move in order to eat the fly. The Davy Knot: Fly changes and adjustments to the tippet go quickly with this simple knot. Use tippet rings: I’ll join dropper tags to the tippet with micro rings, but I often tie an additional micro ring higher up on my leader in case I want to add a dry fly and fish a longer trailing section. Sometimes, I’ll space this highest tippet ring so as to fish a three-fly nymph rig with equal spacing between flies. Sometimes, I’ll place it further up the leader, which would allows me to fish two flies below a suspending dry fly at a greater depth. I let the conditions of the day dictate how I begin. Adjust depth: As I said, I’ll often start by replacing the top dropper nymph of a standard two-fly Euro rig with a dry fly. This places my bottom nymph approximately 20″ below the dry fly. I’ll shorten this considerably at times, particularly when fish are feeding on emerging nymphs or pupae. If I switch back to a tight-line nymph rig, I’ll replace the bottom tippet with a standard (approx. 20″) section of tippet, usually in 5x or 6x. Keep dropper tags short: I find tags less than five inches to be ideal and will go as short as an inch or two. Shorter tags mean less slack to the dry fly which allows greater strike detection for the nymph below. It pays to experiment with leaders and tactics. The difference between a setup that works okay and one that works great can be minor. I primarily use a Thomas and Thomas Contact 1103 three-weight nymph rod with a mono rig instead of fly line. This season, I’ve used 12# mono as my running line with a tapered sighter in an effort to fish with less line sag at longer range. With this set-up, I’m able to cast a dry-dropper rig comfortably and accurately out to about 25′ depending on conditions. I can high-stick the dry fly very effectively with this rig in order to achieve a drag-free drift in pocket water and other situations of challenging current. Torrey’s Hare’s Ear Caddis Pupa hung below a dry fly was deadly during caddis hatches. I tie these with tungsten and brass beads to adjust to conditions. In terms of fly selection, I look for a dry fly with enough buoyancy to float a nymph or two with a decent probability of raising a fish. For nymphs, I generally do not go heavier than a 2.0 to 2.3 mm tungsten bead and often tie variants of my favorite patterns with various colored brass beads in order to find the right balance. Recent praise for the CDC Corn-Fed Caddis is well deserved, and I’ve found it to be an excellent suspender. But, I’ll also use a standard X-Caddis in deer or elk hair down to around a size 16. I dry the fly often with an Amadou patch and apply liberal amounts of Frog’s Fanny. Following a brilliant tip from George Daniel, I grip the fly with scissor clamps in order to spare my hands from the desiccant. A final note on the dry-dropper: I’ve found it to be an excellent reconnaissance tool. Because my attention is focused on the water surrounding the dry fly, I see a lot more fish than I would otherwise notice if I was concentrating on my sighter riding above the water’s surface. The visual takes are hard to beat and the refusals keep things interesting. Tight lines, and enjoy our precious resources. That was an excellent article! Very thorough explanation of the technique and why and when to try it. One question I do have is why 12# mono vs 18# or 20#, and is it a stiff mono like Maxima? Thanks again for a really nice read! Thanks, Steve. I use 12lb Maxima with a sighter that tapers to .009 diameter for longer range tight line or “contact” nymphing. The lighter line equals less sagging effect and more sensitivity during the drift with lighter nymphs and longer range presentations. I was still able to cast a single weighted nymph and a size 12 dry fly a considerable distance. Thanks Damon, will be busy this weekend! Will try new leader-can you share exact specs ? Hi David. I like to experiment with leaders. Right now I’m using the 12lb maxima to 3ft of red 10lb amnesia which tapers to a sighter that tapers in 6” increments (8lb gold stren / green amnesia) down to .009 diameter white cortland indicator mono, terminating with a micro ring. I use blood knots to join sections and leave the tags for visibility.